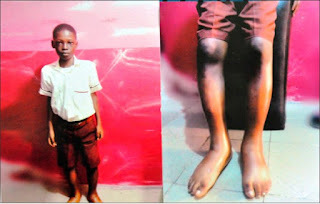 LAGOS – Fifteen-year-old boy, Kehinde Emmanuel Mutairu was seen lying critically ill and helplessly at the Department of Paediatrics and child health, Lagos State Teaching Hospital (LASUTH). His condition appears life-threatening and requires immediate attention. He was said to be having a history of dyspnoea, an abnormal beating of the heart and bilateral swollen leg, mild excretion, cough and is easily fatigued. Mr. Hakeem Osho Mutairu and Mrs. Abiodun Mutairu, his parents, said their son has suffered greatly with the ailment for more than five years without any obvious improvement. Following the boy’s debility, attempts at self-medication and his parents’ inability to decipher what was actually wrong with him, they decided to seek help. They took a decision to meet with a specialist in the Lagos State University Teaching Hospital (LASUTH). There it was later discovered that the child has a hole in the heart which is the obvious cause of his weakness and tiredness. According to the Paediatrician/ Paediatric Cardialogist, Dr. B. A. Animasahun, Department of Paediatrics and child health, LASUTH, Kehinde had a displaced apex beat and a grade four pansystolic murmur loudest at the mitral area. Kehinde was managed for congestive cardiac failure secondary to rheumatic heart disease and he is currently on anti-failure medications and would benefit from a corrective heart surgery. The only remedy therefore for Kehinde is to undergo a heart surgery without further delay, Paediatric Cardialogist said in a letter signed by him and made available to DAILY INDEPENDENT. His grief-stricken mother said that Kehinde had since stopped attending classes due to the ailment. “My son stopped attending classes since we noticed his inability to work well, this has really brought sadness to us and to kehinde as well,” she lamented. Kehinde’s dream has always been to become a well-known engineer and has been practising at home. “He repairs spoilt electronic gadgets in the house and helps us to fix the fixable things even without the supervision of any engineering specialist,” his grieving mother told DAILY INDEPENDENT during a visit to LASUTH. It was so shocking to find such a talented young boy in such a terrible situation, despite all the money that had been spent on him to get better. All his parents are asking for now is assistance from kind-hearted Nigerians to save the young boy’s life, having spent all that their savings on the ailment. “My son has been going through severe pain. We arrived at LASUTH few hours ago for a medical check-up. My husband and I are really scared because he becomes weaker day by day. We thought he would be admitted because of his present state, but he was given extra drugs to add to his other medications,” her anguished mother said. Kehinde’s father, on his part, explained how painful it was to see his son passing through excruciating agony and the struggled to raise huge money for his treatment, but all to no avail. “So much money has been spent on kehinde for his medications and injections, but he is still in this state. He cannot do anything for himself, even to eat is usually a problem; this is just a terrible moment for us,” he said in anguish. He added that he has been using his little income from fashion designing to support his son’s health bills, but unfortunately, his meager income cannot cover the cost of such a major surgery. He further lamented that the specialist on Kehinde’s case, said that if the surgery was not done as soon as possible, he would be encountering more difficulties like the swollen leg. “The swollen leg he has is because the surgery has not been done; the doctor has given us a severe warning that if it is not done on time the leg would swell more with unbearable stomach pain. If ordinary drugs and injections could have saved him, I think Kehinde would have been better because despite the fact that he spent more than a month in the hospital receiving drips and injection he is still in this terrible situation,” Mr. Mutairu lamented. On her part, Kehinde’s mother spoke bitterly with tears as she explained to DAILY INDEPENDENT on how she lost her twins few years back due to an ailment also. “Surgery is the only remedy for his ailment and I do not want to lose him just as we lost his twin. As a mother I can feel his pain and I know how unbearable this has been for him,” she cried out. The devastated mother told DAILY INDEPENDENT that the surgery could only be conducted if the sum of N4 million could be deposited in the hospital. “Our little boy needs immediate help, mothers can understand what it feels like to see their child in an unbearable pain, please come to our aid,” Mrs. Mutairu said weeping and pleading. If you are touched, please contact Kehinde’s parents on 08185139503 or send your donations to Mrs. Abiodun Iyabode Mutairu, GT Bank 0224624700.